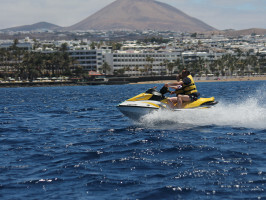 Explore the coast of Lanzarote at full speed with a self-guided jet ski safari! Jet off into the sun and feel the ripples in the waves as you glide over the ocean. 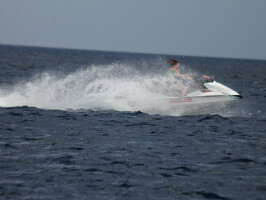 Feel the speed and adrenaline in what is guaranteed to be a fun jet ski experience. 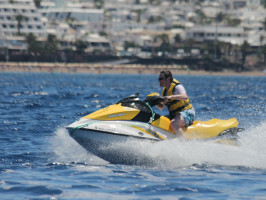 Explore the coast of Lanzarote at full speed with a self-guided jet ski safari! Jet off into the sun and feel the ripples in the waves as you glide over the ocean. Feel the speed and adrenaline in what is guaranteed to be a fun jet ski experience. With a self-guided safari you can race off to explore the coastline of Lanzarote from either Puerto del Carmen or Playa Blanca, or simply enjoy the thrill of riding over the ocean waves. All of the jet skis are modern and well maintained, guaranteeing a safe safari. This will be the most refreshing experience of your holiday! Meeting point: Playa Chica, Paseo Barrilla in Puerto del Carmen and Marina Rubicon Port in Playa Blanca at the diving centre. Duration: Safari: 2 hours. Jet ski rental: 20 minutes. Start/ opening time: 10am and 3pm. Languages: English and Spanish. Others: Jet ski minimum age: from 16 to 18 years old, should go with a signed parent or guardian. For clients staying in the Playa Blanca area, we recommend using our diving centre located at Maria Rubicon port, Playa Blanca. For clients staying in the areas of Costa Teguise, Arrecife, Puerto del Carmen or Puerto Calero, we recommend using our centre located at Playa Chica, Paseo La Barrilla in Puerto del Carmen. Please exchange your voucher at: Paseo Pila de la Barrilla, s/n, 35510 Puerto del Carmen, Lanzarote. Start time/session: Safari Sunrise at approximately 10am, Safari Sunset at approximately 3pm. Short Safari and rent a Jet Ski from 11am. Duration: Safari Sunrise and Safari Sunset approximately 2 hours, Short Safari 45 minutes and rents 20 minutes. Children aged under 18 years must be accompanied by an adult, age limited to 16 years. Opening days/period: Open to the public every day from 10.00am to 5.00pm all year round. This activity is not recommended for pregnant women/ people with heart problems and other sensitive illnesses.